What makes an establishment or other tourism product universally accessible? Is it 10 out of 10 ticks on a checklist of international standards – or is it something more than this? 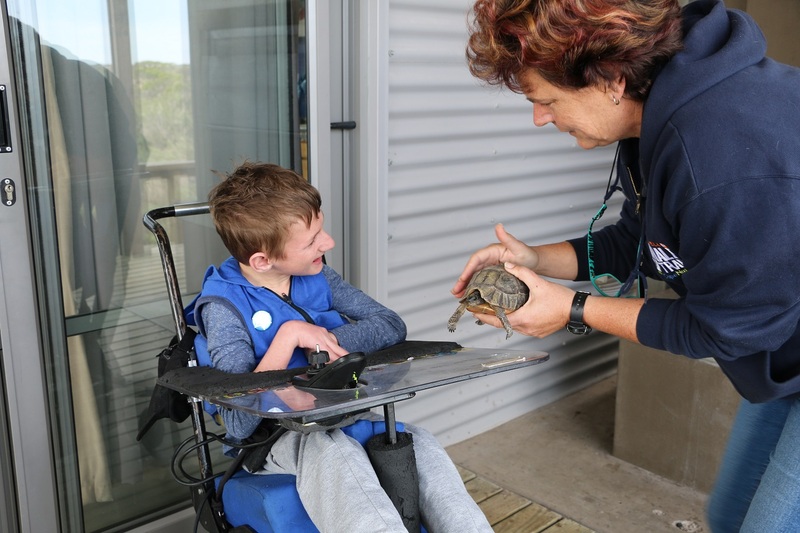 As an organisation focused on giving differently-abled children tourism experiences, universal access is the core of what we promote through the adventures we enjoy with our Warrior On Wheels families, and to discover that a key player like Cape Nature has accessibility at the foreground of its design and planning is encouraging for the ongoing journey towards universal access in tourism. As such, an MOU between Warrior On Wheels and Cape Nature has us visiting their reserves for an experience-based persepective on the UA features implemented. The first of these visits brought us to Rocherpan Nature Reserve on the West Coast, a leisurely and picturesque 2 hour drive from Cape Town, joined by two couples: Richard & Ella Brusser, and Dave & Pippa Gale. On arrival we were please to find wheelchair accessible parking bays available, and that the reception area has ramp access. There are eight cabins in total, four of which have been designed to be universally accessible. These four are all accessed with boardwalks that lead from the parking and reception area and all interlink with each other. 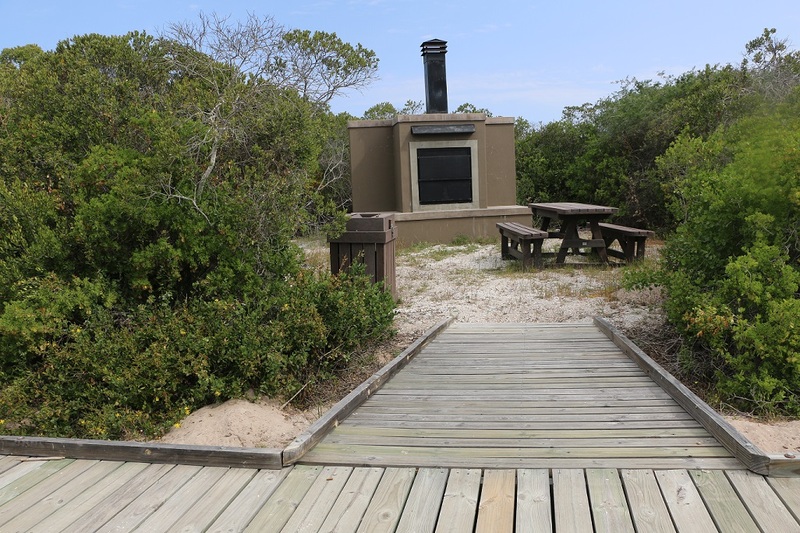 The cabins each have a wrap-around veranda with a built-in braai and a solid wooden bench-table. The open plan lounge, kitchen and dining area are spacious enough to move about in a wheelchair. There are two bedrooms – a twin and a double, as well as a futon in the lounge for extra guests. The bathroom has a large, accessible shower with an adjustable shower head. I was taken back to my childhood of Transkei visits with long-drop loos, but was pleasantly impressed with the modern sophisticated version – compostable toilets! They are waterless… and odourless! Well done to Cape Nature on their conservation efforts, while not skimping on personal comfort. 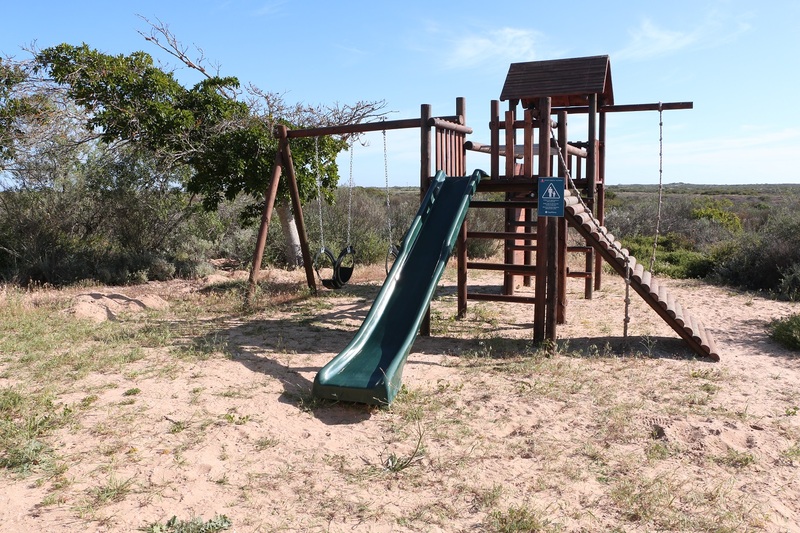 Families will love the pool and playgym area – keeping young bodies active and busy minds occupied with enough activities for everyone and tortoises in varying sizes scurrying (yes they move surprisingly quickly) between the bushes and boardwalks. 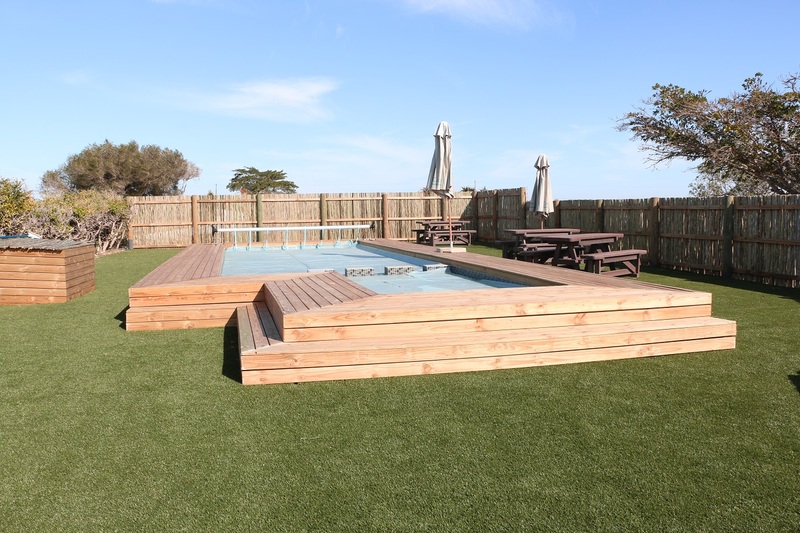 The area around the pool is flat enough to wheel over in a wheelchair, and for a disabled person with upper body use, the swimming pool deck is accessible for transporting from chair to platform. There are two options for accessing the day visitor picnic area and birdhides: either take a drive back out the main gate to a second entrance a little way down the road, and make your way via the dirt road to the parking bays; or, as we ventured, take the offroad hiking trail for an exhilirating walk/ride. 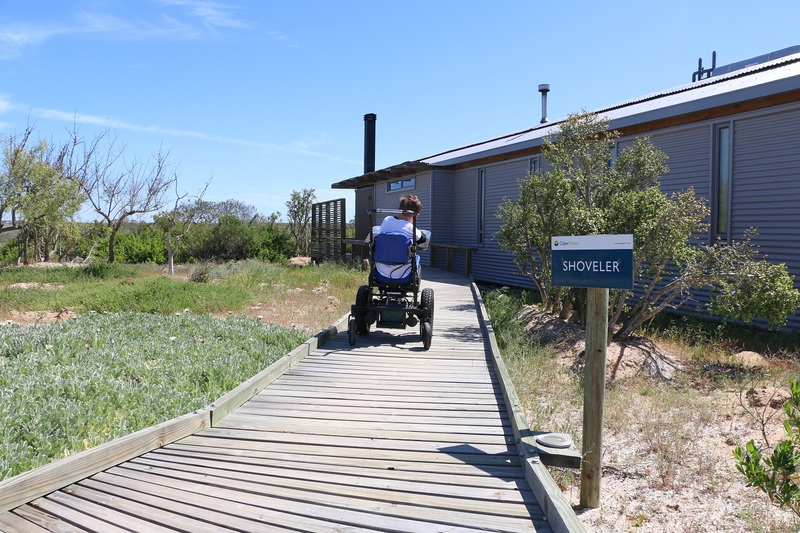 I wouldn’t say it is an accessible path for anyone using a manual wheelchair, but Damian has a motorised wheelchair so with some careful driving, we managed to avoid sinking into any mole holes and enjoyed a hiker’s meander to one of the birdhides, and then to the picnic area. 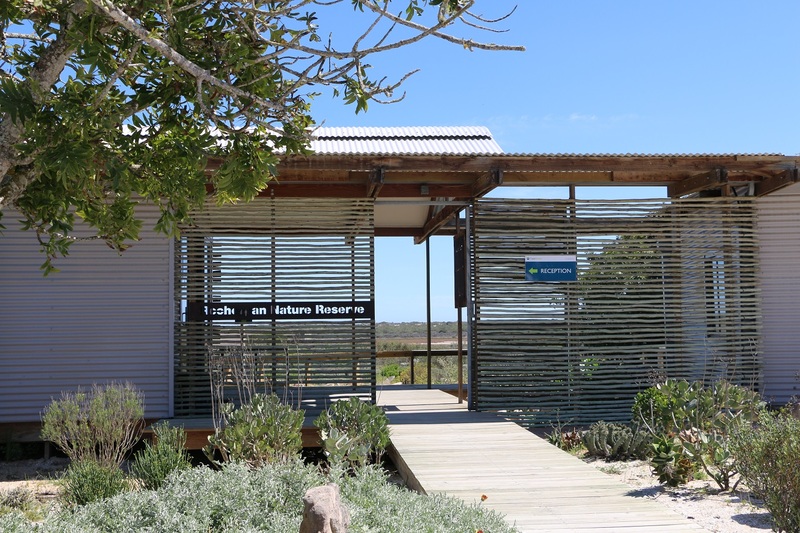 From the parking area, there is a boardwalk that access the picnic area, the bathrooms and the birdhides – all easily accessible in a wheelchair. 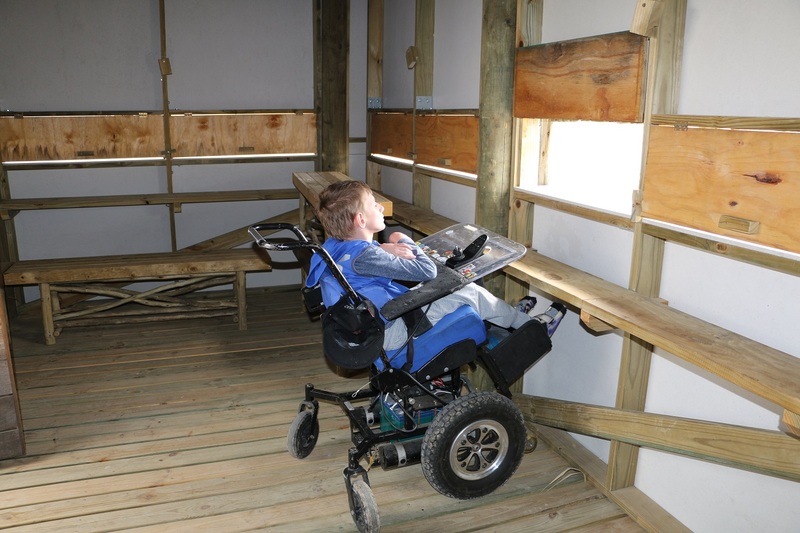 The bird hides have really been thoughtfully designed, with boardwalks providing access and strategically placed for the best view of the pan, which unfortunately was dry at the time of our visit. The viewing platforms are at different heights, with a movable bench, so they are accessible for a wheelchair-user. I’m sure in times where the pan is full, it must be magnificent to view the bird-life from these secret dens. What a wonderful team! We were greeted by Tanya on arrival and from there we felt welcome, at home and informed. She was always helpful, and close at hand if we needed anything, going out of her way to make our stay comfortable and ensure that we experienced everything there was to experience. On meeting with the rest of the team, we found a genuine interest and eagerness to learn how to interact with guests with disabilities – when and how to offer help, and how to prepare the accommodation before arrival – simple things like adjusting the height of the shower head, and removing lose mats in advance.